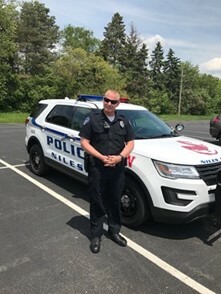 As many already know, the Niles City School District and the City of Niles have partnered together to provide a full time School Resource Officer. I have accepted this position with tremendous pride, and would like to take a moment of time to introduce myself. My name is Patrolman Steve Corll. I have been a police officer for over 8 years. In addition to my regular duties, I’ve had the opportunity to work various school based policing assignments as both a Niles Police Officer, and former Mahoning County Sheriff’s Deputy. It’s here where I developed a passion for this special type of policing. Prior to law enforcement, I served overseas with the U.S. Army during Operation Iraqi Freedom. I graduated high school in 2000, and have recently earned my Bachelor’s Degree in Criminal Justice. I now have 4 children of my own, and fully understand the importance of providing a safe and healthy learning environment for our kids. Rest assured, I will assist the school administration however possible to help ensure this goal is met. Throughout the year, your children will likely see me on a regular basis. As a School Resource Officer, I may be utilized in many different roles. Mentoring students to keep them out of trouble, presenting on special topics, and simply being a positive role model, are all routine duties I will have. However, please be advised that first and foremost I’m a police officer. The most important duty of all, and one that will never deviate, is to help keep our schools safe. When appropriate, I will enforce the laws of both Niles City and The State of Ohio. Overall we have been off to a great start. I’m very excited to be in this new full time position, and look forward to our continued success. Please feel free to contact me with any questions, comments, or concerns you may have. I can be reached via e-mail at SRO@nilesmckinley.org, or you can stop by the Niles Mckinley High School.